Happy 6th Birthday Your Next Stamp! Told you, didn't I?! Want another peek? Tell me you're not saying 'ahhhhhhhhhhh' right now. These cuties aren't the only thing that will get you in a celebratory mood, Peeps. Over in Store, there's a free Birthday Stamp Set with purchases over $40 (while stocks last) and a Choose Your Own Discount Deal. Happy Birthday Everyone. Now, before you scoot off to Your Next Stamp and get into awful mischief, don't forget to leave a comment here, and at each stop of the Hop for a chance to win one of three $50 Your Next Stamp Gift Certificates. Swoon! 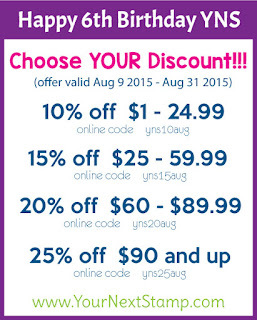 You have until midnight on 11 August (that's 5am UK Peeps.) 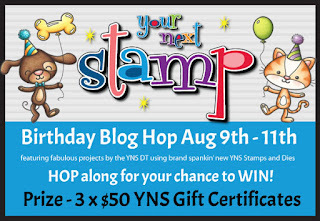 to complete the Hop, and Winners will be announced on the Your Next Stamp Blog on 12 August 2015. Ahhhhhhhhh is right Faye! AhhhhhhhMAZING! Super sweet card, good job! Sweet card!! Love all those cuties standing together!! 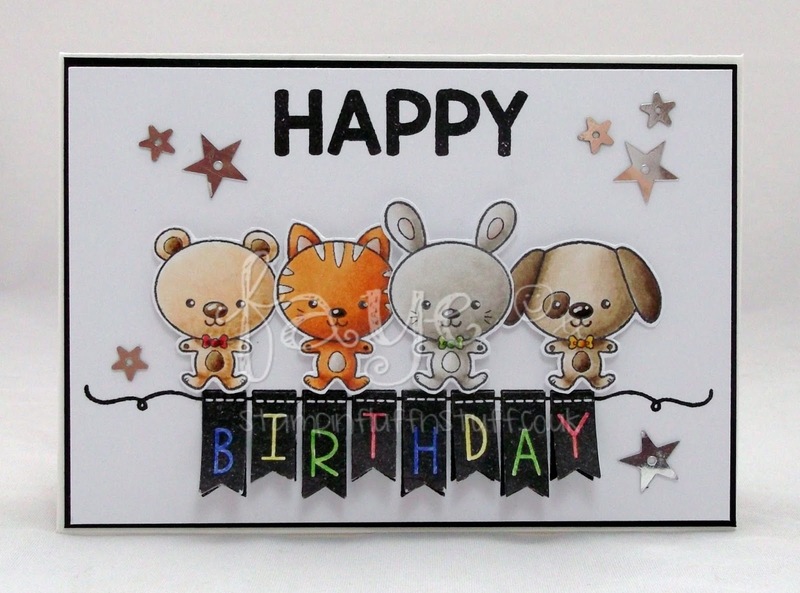 Yes ahhhhhhhhh cute card ;-)and cute critters. Oh how fun! I love these little cuties! LOL I said "aaahhhhhh cute" and then I started reading! Too funny. Yes the card is adorable!! Love it! One of my favorites on the hop so far!! So cute - love that fun row of critters. Sweet, sweet! Those Party Animals are adorable all lined up! Love your coloring! Faye, your card is just the cutest birthday card. Amazing colouring! 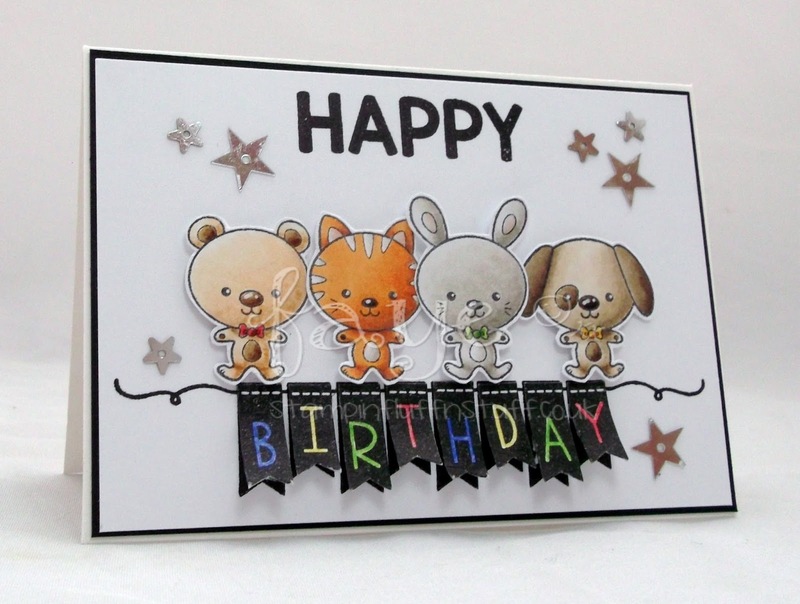 Love your coloring of that adorable pack of critters! 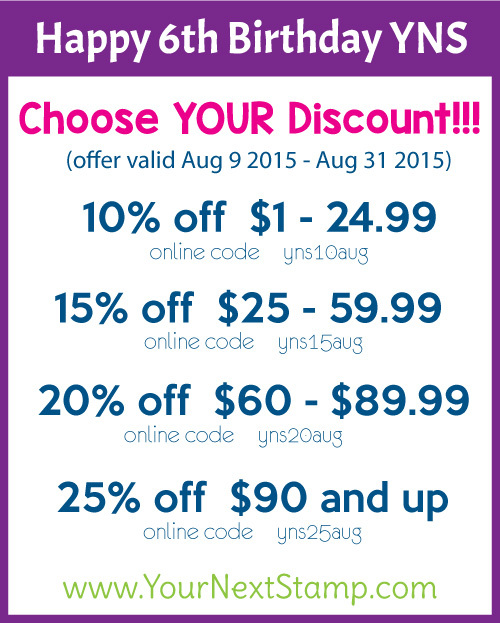 Congrats to YNS on their 6th anniversary! Love that cute little herd of critters! Beautiful coloring! SUPER cute design!! LOVE IT! I am I am saying "Awwwwww." So cute! Great coloring. Ohhhhhhhhh SUPER CUTE!!! Love this so much!!! CUTE! CUTE! CUTE! A gorgeous card Faye, beautiful colouring and design. So stinkin' cute! I love your card and this set has to go on my Wish list! What a fabulous card!!!!! Love the banner and all the cute critters- so fun! I love all the new releases and the cards that were made using them but this has to be my favorite card as well as my favorite new release. Love the card. Fab card - those little critters are ADORABLE! Very cute card. TFS with us. those are the cutest little animals. Amazing coloring job on the adorable critters!! I love how you put this card together. The dimensional birthday banner is perfect. WHAT!!!! Those little guys are part of the balloon set??? Oh, now I need it. They are just too stinkin' cute. Love how you have paired them up with the banner. Super fun! These party critters look like they are having the best time! Also like the black banner! I just love your card. The way you brought that banner to life with the bold black card stock and the bright bold letters is awesome, as is the way you have those banners coming off the card! Faye I absolutely LOVE your card - the little row of balloon buddies is colored so beautifully and they are so adorable. And they are just perfect with the little banner sentiment underneath. Anyone would be thrilled to receive such a wonderful card! That is ah-do-ra-bleeee! Your colouring is amazing! Well no........ I didn't go 'ahhhhhhhhhh' - I went 'AWWWWWWWWWWWWWWW' .... there's a subtle different!! HOW FAB is this?! Love it! How totally, absolutely, utterly adorable!! Your colouring is fabulous. I love these cute balloon buddies, definitely on my wish list. Oohhh how cute are these great, great. Love your Balloon Buddies card idea! I love this, fabulous card! Great coloring and I love the layered banner! Super cute! Such an adorable card!!! These little critters are too cute for words and I like the way you doubled up the black banner in such a contrasting way. Great card!! I absolutely love the little animals in this set!! Your card is so cute! Adorable card Faye! Wonderfully colored of course and cute x 4. Great to have you joining us for the celebration. Cute. I love your coloring. Ack! Cute in every way! Love these darling little animals! Great Card! Love how you layered the banner! Great Detail! Love how you shaded and colored the animals! Great job. So darling, and so excellently made and beautifully colored!! Love the way the card is styled and think that you are wonderful!! This is super cute Faye. 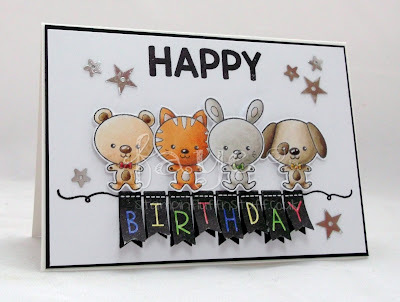 Just adore the little critters perching on the birthday banner.